You are here: HomenextPeoplenextPlayer ProfilesnextMorris, Roy "Digger"
John A'Bear and Roy Morris, Gloucester's heavyweight second row forwards, who each tip the scales at 15st! Roy “Digger” Morris was a lock forward with a hard uncompromising reputation in the Kingsholm tradition. He made 311 appearances for the club between 1932 and 1948, and captained Gloucester and Gloucestershire in 1946-47. He had trials for England and was a travelling reserve. W R Morris was born in Gloucester in 1910/11 and learnt his rugby at Hatherley Road School. He came to Gloucester RFC from the Gloucester Wagon Works club and after winning his United cap in 1931-32 he made his debut in the senior side later that year. He played in Gloucester’s first double over Newport for 50 years and at the end of the 1932-33 season the Citizen said that “in R Morris the City found a second row of real merit and if he continues to improve, county honours should come his way”. He played regularly in Gloucester’s record-breaking 1933-34 season. Digger played for Moseley in the 1934-35 season while working in Birmingham but returned to the club for 1935-36. His formidable heavyweight second-row partnership with John A’Bear (who was best man at his wedding in April 1936) became one of the strengths of the Gloucester side in the years leading up to the 1939-45 war. He made his Gloucestershire debut against Somerset in October 1937 as a late replacement for John A’Bear and was to go on to play in every county game until the end of the 1946-47 season. That year he captained the county to the final against Lancashire, which was drawn, Gloucestershire narrowly losing the replay. 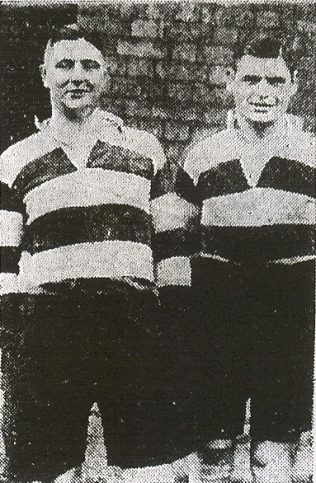 Digger played for the Possibles who beat England 18-17 in December 1938. He played for the RAF during the war and was a travelling reserve for England in 1946. After the war he played on for Gloucester for three more seasons, captaining the club in 1946-47 when Tom Price had to withdraw due to ill health. Morris played in the first few games of the 1948-49 season, but announced that he would retire after the Bedford game on October 2 at Kingsholm. This was on a county day and typically he captained a much-weakened team to an honourable draw. The Citizen said that “Gloucester will miss not only his weight and experience but the lovable and cheery personality of a player who is a sportsman through and through”. After retirement he remained involved in local rugby and served on the Gloucester committee. His advice to a young Mike Burton to “Never Stay Down” seemed to sum up his whole career. See also multiple press articles on Digger. Hear a snippet of Digger singing his famous “Pig Song”.